Somebody push the play button…I can’t hold this pose forever! Party Rock is in the house tonight! Uh oh, did I forget to step on that last base? Um, am I going the right way? I ain’t afraid of no ghosts…. I take it back, Lorde, I take it back! You’ll be a Royal. Now stop chasing me. Did Canseco really just let that ball bounce off his head? Kick those knees up guys. Come on..that it Bo. And 2 and 3.. Looking back to 1985 & moving ahead to 2014! Hey, which way is the Hall of Fame? Gotta get a seat on the Royals bandwagon!! Uh oh, Mama told me never to steal and I just stole that base, AHHHH, Here she comes!! Gotta go! Very well. Begin the thawing of Jim Nabors. 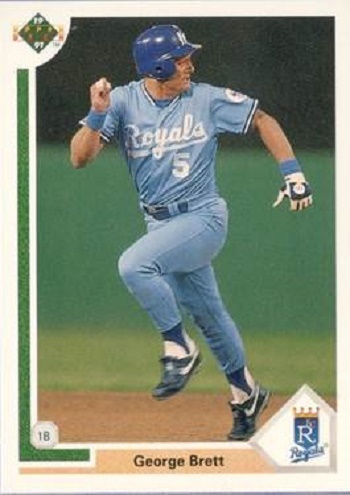 The day the umps had their revenge with George Brett. Oh no, it’s the pine tar cops! Uh oh! Is Bo Jackson really that mad that I beat him in Tecmo Bowl? Yeah . . . Stolen Base Number 10 . . . What? Inning Over? I said “you’re it”. Now you’re supposed to chase me! Not going to catch Me not this time bucko!!! Hey I’ll be right back homie moms making meatloaf!!! WHEN I LOOKED OVER MY SHOULDER, IT GOT A LITTLE BIT COLDER! Congrats to Paul B.! Your witty comments have scored you a complete Upper Deck 25th Anniversary Set! Thank you to everyone for participating and we hope to see your comical comments again next week. Keep that pine tar away from me!!!! If I keep running maybe the Royals will keep winning!